THREE NEW ATTRACTION THEMES FOR 2016! 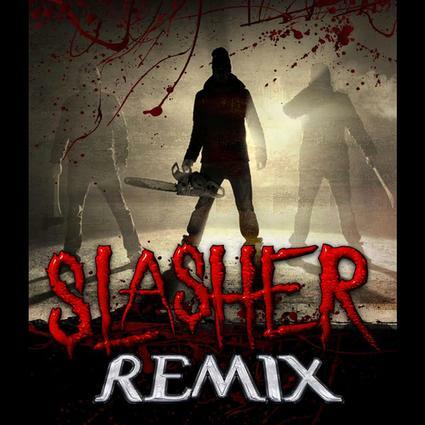 SLASHER REMIX You remember the nightmares, don’t you? A masked psychopath with a chainsaw, a bladed hand, alone in a cabin in the woods. You tried to scream but nothing came out. No one could help you. Well, we’re sorry to say you don’t outgrow the fears of the slasher films of yesteryear... you just hide them away. This year, we’re resurrecting those exact memories, twisting the characters that haunted you the most, and making you face them as you try to make it out of the cabin in one piece. Will you overcome your nightmares this time around,? There is only one way to find out... UNDEAD: ABOMINATIONS The rumors and conspiracy theories are true. You are sure of it. You’ve heard about the subterranean labs deep beneath the hum drum surface of River North—the experiments, the mutations and the discarded bodies that are buried there far below the businesses and condos we see today. But there is no rest for the “Undead”; quite the contrary. Many of the subjects were experimented on and survived the now-abandoned lab and the mutations continued under the watchful eye of guards and quasi-scientists... until something unthinkable emerged from the bowels of the earth... an “Abomination”. Indeed, the walking corpses that now terrorize the deep dark passageways and nooks of the underground have begun to find their way out. Will your group make it through unscathed or will the Undead: Abominations take some of you for their ranks? CURSED: THE RITUAL The hamlet of Blackmoor has been overtaken by werewolves, which emerged from the nearby cemetery’s cavernous crypts and tombs a year ago. But the mystery remains as to how the town’s citizens are taken into this dark wolven tribe. Cursed: The Ritual takes you back to before the “Feral Moon” awoke these ravenous creatures, when the living and the undead were revived by the act of necromancy of a local “bokor,” a sorcerer or witch. That’s right... VOODOO! These undead canine beasts can be traced back to Haitian roots and their red eyes are a sign the evil has taken possession—as goes the folklore. A zombie remains under the control of the bokor as a personal slave, having no will of its own, so you must be strong as you pass through these unhallowed grounds. Can you resist the call of the voodoo priestesses or will you be called into the order of the ritualistic, cursed werewolves like so many before you? 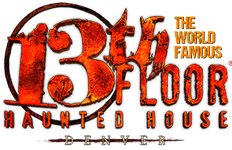 THE LEGEND OF THE 13TH FLOOR Come with us, as we attempt to explain the legend of the 13th floor, and introduce you to Denver’s most horrifying haunted experience, the 13th Floor. The levels of a multi story building are frequently numbered sequentially, from "basement", “lobby”, “ground”, "one", or “1” upwards or occasionally downwards. In some countries, as it is here in the United States, the number 13 is considered unlucky and building owners will sometimes purposefully omit a floor numbered 13. Even building owners who are not themselves superstitious realize that the desirability of units on the 13th floor might be compromised because of superstitious tenants, or commercial tenants who worry about losing superstitious customers. Based on an internal review of records, the Otis Elevators company estimates that 85% of the buildings with their elevators do not have a named 13th floor. Why are skeptics so easily convinced that the majority would just rather avoid the 13th floor? What has happened in history to create such a stigma about a 13th floor? For whatever reasons there may be, there seems to be a multitude of stories about what happens on the 13th floor, some documented, some not. It seems that it has become largely accepted to just leave this mystery alone, brush it under the rug, and don’t talk about it. A good example is that some have suggested the 13th floor in government buildings is not really missing, but actually contains top-secret governmental departments, or more generally that it is proof of something sinister or clandestine going on. It should be noted that to place a floor between those accessible from an elevator, it is necessary to either take longer to travel between the neighboring floors, or accelerate, both of which would be noticed by the riders. It would also be noticeable from the exterior, requiring either an extra row of windows or a conspicuous gap between rows. Thus, it would make much more sense to build a secret floor, such as the 13th floor as a basement, making it much easier to hide 13th floor's location in what appear to be single story buildings, underground. We, the creators of the 13th Floor Haunted House, have discovered locations, right here in Denver, Colorado constructed in the manor described above. Not completely sure of what all of their past uses may have been, it seems that the majority of these locations are currently inhabited as a home for the fortunate or unfortunate souls, living and dead, that have discovered their secret locations when seeking shelter from the environment, or society. Various species of rats, snakes, and spiders have also taken up residence here, living in secret, by their own rules. This year, as in the past, and future, we will open one of these locations for you to tour. Step inside, take a ride, and travel through the 13th floor, visit the current occupants who call it their “home”, witness the oddities and strange occurrences that have created the legend of the 13th floor, and discover why it continues to be one of the world’s greatest mysteries.